Copyright 2009 Taylor & Francis. Women of lower educational attainment are more likely to eat unhealthy diets than women of higher educational attainment. To identify influences on the food choices of women with lower educational attainment, 11 focus groups (eight with women of lower, and three with women of higher educational attainment) were held. Using a semi-structured discussion guide, environmental, social, historical and psychological factors known to be associated with food choice were explored. Audio recordings were transcribed verbatim and thematically analysed. 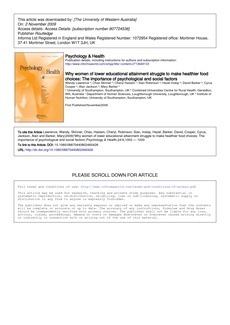 Compared to women of higher educational attainment, women of lower educational attainment had less control over their families' food choices, less support for attempts to eat healthily, fewer opportunities to observe and learn good food-related practices, more negative affect, more perceived environmental constraints and more ambiguous beliefs about the consequences of eating a nutritious diet. These findings provide a starting point for taking forward the design of an intervention to improve the diets of young women.